Noémi Ban’s story of the loss of her mother, grandmother, thirteen year-old sister and 6 month-old baby brother and of the suffering she survived while in Auschwitz-Birkenau is tragic, however, the message of this award-winning teacher’s new book is one of tolerance hope and love of life. Several themes pervade each chapter: the importance of perseverance, determination, friendship, responsibility and freedom; the dangers of bigotry, hatred and teasing; and as the title implies, the value of family, friends, trust and sharing in healing from a great loss. 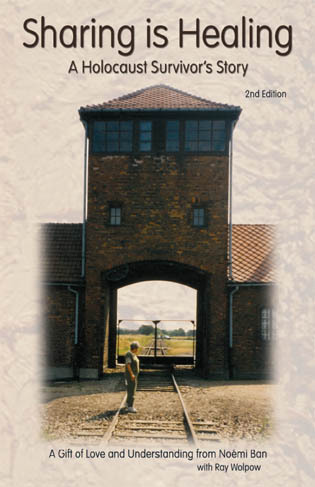 The final two chapters include narrative and photos from Mrs. Ban’s return to Auschwitz in 1995 and 1997, as well as suggestions to readers as to lessons that may be learned from this period of history. Understanding what happened during the Holocaust is a challenge to any human being. Believing that any person, young or old, should be able to read and understand the messages of her story, Noémi Ban writes in language that any reader, with fifth grade or higher reading skills, should be able to understand. Noémi Ban is winner of the 1997 Golden Apple teaching award, a 2001 recipient of an honorary doctorate from Gonzaga University, of, the 2003 Washington Education Association Human and Civil Rights Award in the category of International Peace and Understanding, the 2004 Washington State Holocaust Resource Center’s Award for Excellence in Holocaust Education, a 2006 inductee in the Northwest Women’s Hall of Fame, and most recently the 2010 Daughters of the American Revolution Americanism Award. Ray Wolpow is a professor of secondary education and the Director of the Northwest Center for Holocaust, Genocide and Ethnocide Education at Western Washington University. He is the author of several books and journal articles on the trauma and learning, literacy education and Holocaust education.